The Rainforest is the most species rich place on Earth and therefore an incredible resource to study ecology (= the biological study of interactions of plants and animals with each other). Costa Rica is a great place to observe such interactions in a healthy environment. But it also reveals the dangerous consequences of deforestation and further environmental threats. Although 26% of its territory are protected, Costa Rica lost about one third of its rainforest during the 20th century and rainforest protection still remains an important political issue. Learn more about your possibility to protect Costa Rica’s forest in the section Ecotourism. Relatively low trees, usually in two layers: one 20-30 m high and a more evergreen, the other on heights between 10-20 m. Most trees lose their leaves during dry season to save water. Distinctive seasonal changes occur. Dry Forests are best to watch wildlife. They run, however, the highest risk of deforestation because their rich soil makes for excellent agriculture. Classical evergreen forest with tall trees up to 50 metres; sparse ground layer. Tropical moist forests are probably the most species rich habitats on Earth (for both plants and animals). In the highlands forests are evergreen, while there is a mix of evergreen and deciduous plants in the lowlands. Trees can grow up to 60 metres, but their size decreases on higher elevations. There are usually two tree layers, a canopy and subcanopy. Cloud Forests can be found on high altitudes where the landscape is persistently wrapped in fog and clouds. Epiphytes such as orchids, mosses and bromeliads abound in these forests. Tropical rain forests cover around 7% of the earth’s land surface, but they contain more than half of its species! They occur between the tropics of Cancer and Capricorn, close to the equator. Tropical soils are generally poorer than the ones in more temperate zones. This is because organic matter is absorbed by living plants, bacteria and fungi before it can build up the soil. As there is little sunlight on the bottom, the ground layer is sparse and most animal species are found in the canopy layer, a dense mass of treetop greenery. The struggle for light is essential in tropical forests, which one can observe already within a few weeks after dormant seeds in the soil begin to sprout. The variety of plants is amazing. Besides huge trees and large-leaved understory plants, you will find “climbers and stranglers” – also known as vines or “lianas” – that ascend or descend along tree trunks, “epiphytes” (such as Orchids and Bromeliads) that grow on other plants without harming them and, of course, a variety of palms. 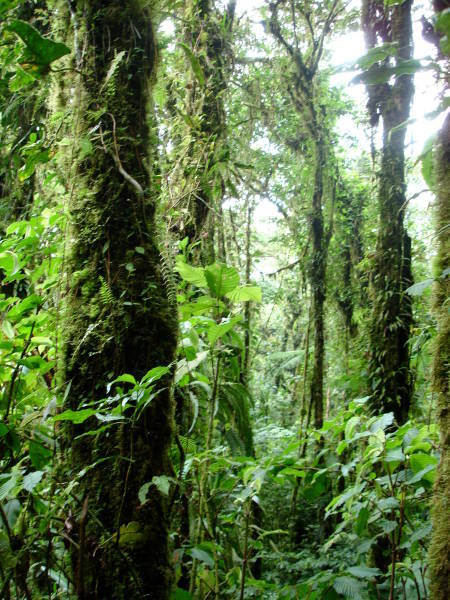 Tropical moist forests make the most extensive life zone in Costa Rica. Primary Forest describes forests that have not been cut down or exposed to other human interference. They are more intact and thanks to an unaffected ecosystem represent the most species rich zone on our planet. Secondary Forest is a forest that has re-grown after major damages. Mostly these are due to human interference like deforestation. Fires or insect infestations are further reasons. There is less biodiversity and mostly only one canopy layer. It takes more than 150 years until secondary forest begins to resemble the more dense and higher primary forest. Corcovado National Park is home to the largest continuous undamaged primary forests in Costa Rica, but portions of intact primary forests can be found all over. Despite of many National Parks and Protected Areas, Costa Rica still has one of the world’s highest deforestation rates (3,9%/year in 2007). The country lost about one third of its rainforests from 1950-1988. The forest mainly gave way for cattle ranches. Such pastureland further harms the ecosystem through ground compaction that impedes many plants from growing, as well as nutrient depletion and erosion. Often, monocultures like bananas, pineapples or coffee are established, which are heavily fertilized. Pesticide use is a further harmful factor – which is also a menace for groundwater. The importance of forest preservation cannot be underrated. The tourist factor has set off many great project in Costa Rica but it is important to plan for sustainability in the future and to be vigilant at all times!